Looking for a last minute DIY Mother's Day gift or a quick pick me up for your porch or patio that's both cheap and easy? Well, you're in luck! 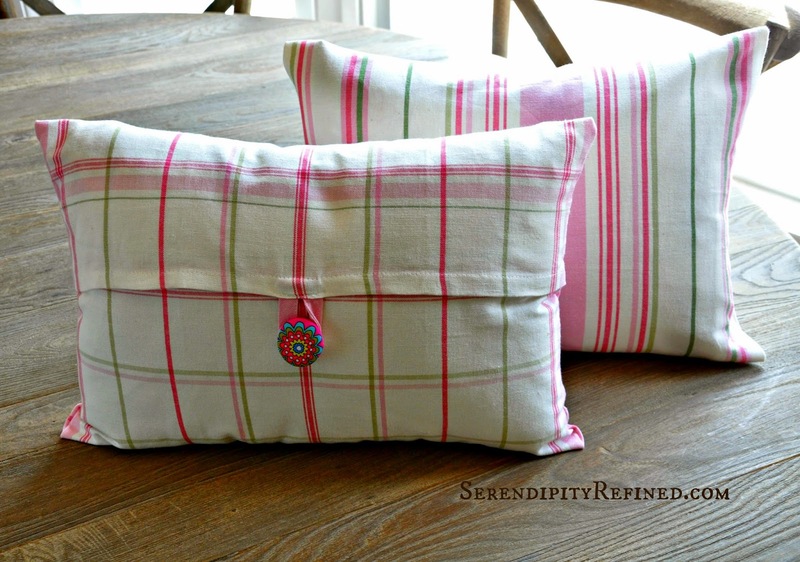 I made these pillows from two cotton tea towels that I purchased at Ikea for $4.99 for the pair. I've also seen them at Target, JoAnn Fabrics and just about any store that carries kitchen items. Making the two of them took ten minutes....literally. There's not even any cutting involved! 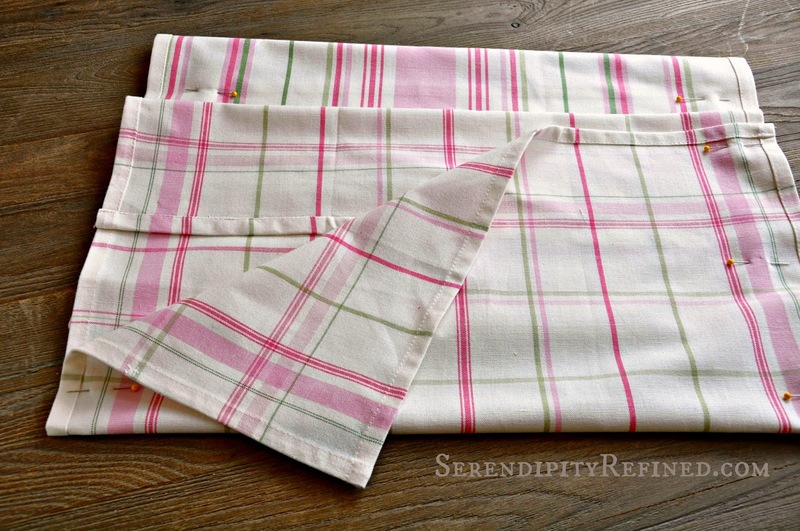 I simply pressed and folded the tea towels to fit my pillow forms (Mine are 12x18) by overlapping them as shown. I use the loop that's meant for hanging them as a button loop. 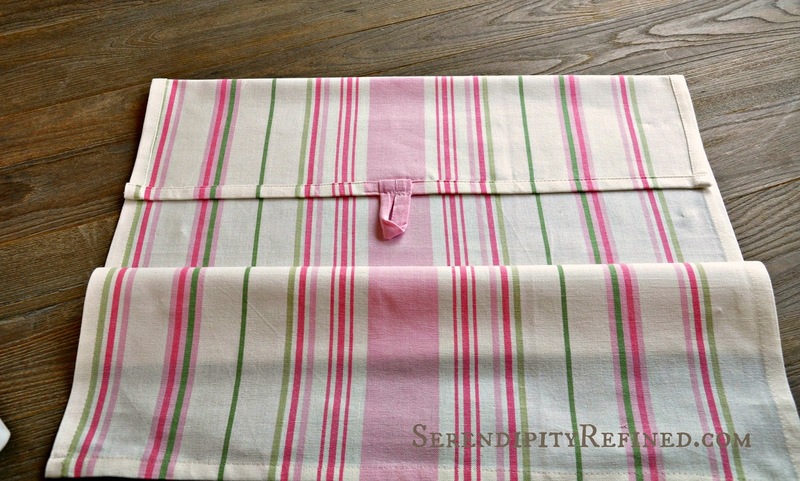 Make sure that you fold your towel with the right sides together and the "flap" folded in first. Like this. Then fold the bottom flap "up", pin in place and stitch about an inch from each side. or, if you're me, to keep for yourself because you're having a big ol' pity party that your house is under construction and there's not a single pretty thing in it..unless you happen to love drywall dust....and having to watch television sitting on an ottoman in the 4 x 6 foot foyer....with the dog. 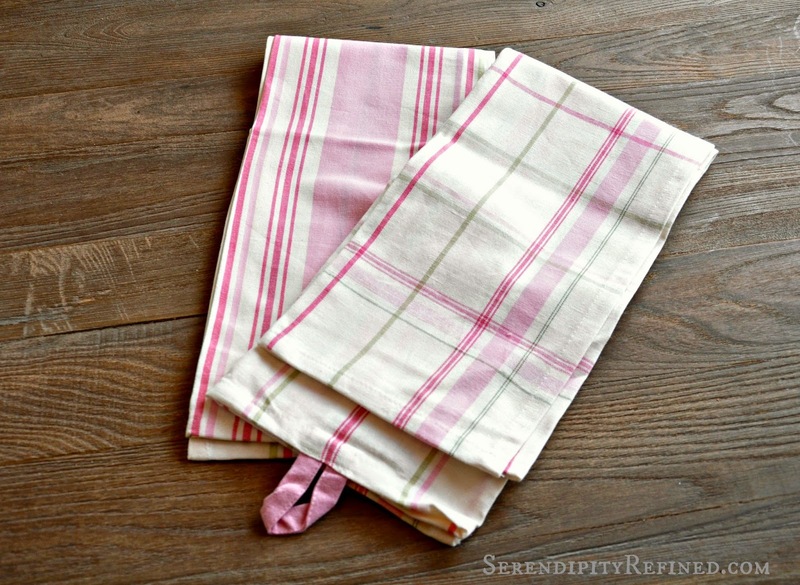 I also discovered that because these were "no cut", when I get tired of using them as pillows, I can simply snip the seams and repurpose these tea towels as.....you guessed it.....tea towels! There you have it! 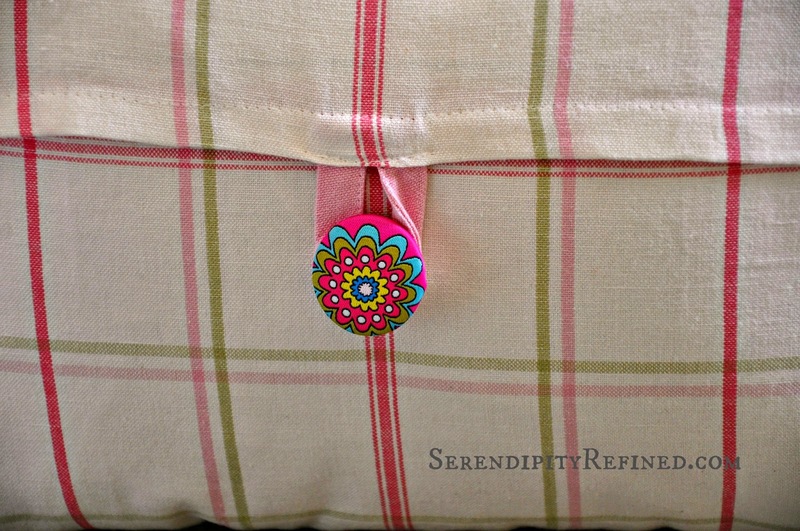 A super easy, DIY for those of you who may have recently discovered (like I did) that Mother's Day is less than a week away It's been so cold here that I honestly forgot that it was May!) 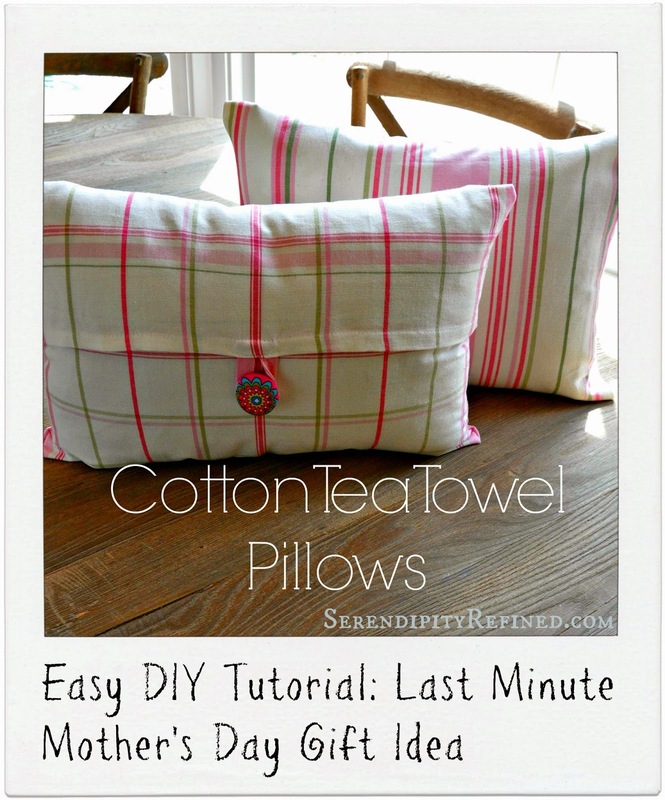 and who may be looking for a last minute gift idea that costs under $10 and can be made in 10 minutes. 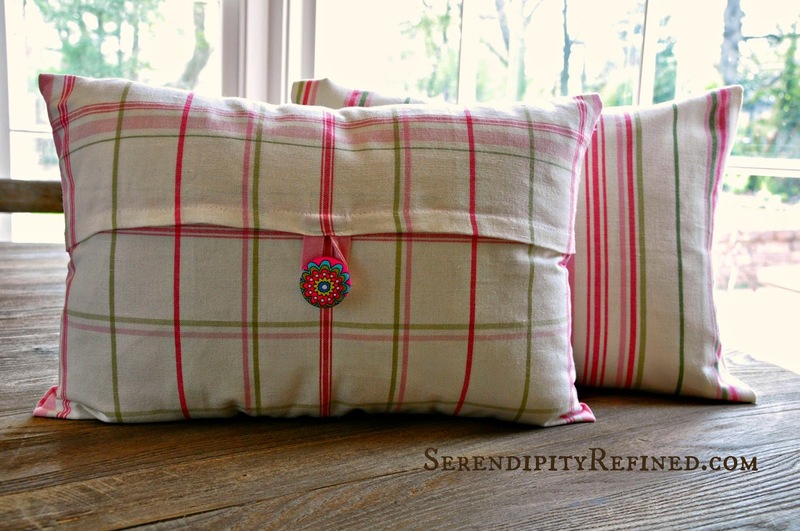 I know that I'm always thankful for gift ideas like that...especially in light of the fact that my oldest is graduating from college six days after Mother's Day! I'm also thankful that the drywall sanding in the dining room will be finished today! Happy Tuesday!